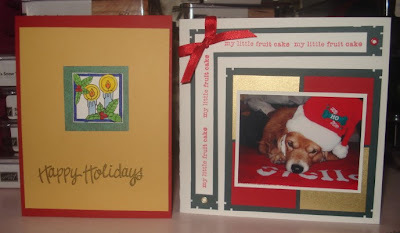 I received these 2 beautiful holiday cards yesterday, one from Cheryl and the other from Diane (and her doggy Stella). Thanks gals... they're wonderful! :) I wouldn't have met either of you without Stampin' Up! so I feel very blessed to know you both, and get to stamp with you on a regular basis! These 2 pretties came in today's mail... the snowman one is from Nancy (one of my 2nd level downline) and the snowflakes one is from Marika, a french-Canadian demonstrator in my 3rd level. Both are truly lovely ladies and very talented stampers too! !